Soy wax candles have become the mainstream candle of choice. While soy has had a reputation of being difficult to work with in the past, there are now very stable blends on the market. We have chosen the top soy waxes which will give you the best results, and that we personally use for our candles. The soy blend waxes we carry have very little shrinkage and one pour may be all that is needed in most containers! All of our soy waxes are in flake form for ease of use. We get a lot of questions on which soy wax to use to make candles. This is a brief guide to the difference between Soy Wax brands. First decide - do you want to make container candles, or votives/pillars/tarts? NatureWax C-3: This is a container wax and is great wax for beginners. It is easy to work with and has fantastic scent throw. It gives a little more "rustic" look to the candles. It is harder to get smooth topped candles and you may have "wet spots" on your glass. Good for lotion bars. 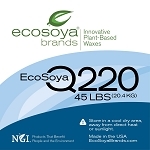 EcoSoya Brands, LLC - Cierra Candles will begin providing the newly formulated Quantum soy waxes by the beginning of August. We will carry the Quantum 210 and Quantum 220 waxes. Please check back regularly for updates on pricing, usage, etc. We do not recommend using additives in soy! UV Inhibitor is ok to add, but you should not add Vybar, or Stearic acid to soy. It will give unpredictable results. 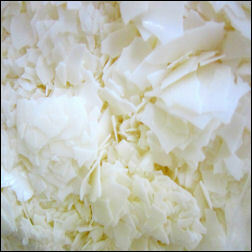 NatureWax C-3 is 100% soy wax for container candles, 125 - 130 °F meltpoint. Excellent scent throw. Comes in easy to use flakes. Can be used in lotion bars and soap. 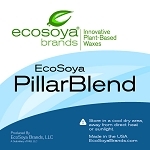 Ecosoya Pillar Blend is a natural soy wax designed specifically for making pillars, votives and tarts.